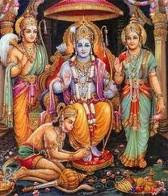 The Avatharas of the Lord take place in order to establish dharma. Those who act against Dharma are the wicked and ignorant. They have to be destroyed, rather their cruelty has to perish. Those who follow Dharma are the sadhus. They have to be protected.. Thus in each and every avathar the Lord protects the sadhus, destroys the evil and re-establishes dharma. Besides these in avatharas like Sri Rama Avathar or Krishna Avathar the specaiality is that the Lord follows Dharma Himself and teaches the world an appropriate lesson. The Devas were tormented by Ravana. Ravana was a rakshas belonging to the Pulasthya vamsha. He was mighty in his own right. Besides this he did penance and got a boon from Brahma that no deva or yaksha or gandharva can kill him. Hence it was such that Ravana could not be won by anybody. All the Devas met and decided to surrender to the Lord. But the Lord, the ocean of mercy appeared Himself. The Devas, did not have to go to the ksheerabdhi or any other place. The Lord Himself arrives mounted on Garuda. This sloka describes the beauty of the lord when he arrives thus. The Lord holds the conch, discuss and the mace, beautifully clad in a yellow silken attire, effulgent as a crore of suns, wearing several ornaments full of lustre arrives on Garuda like a sun in the midst of clouds. The Devas prostrate at His feet. Vishnuhu Upayaathaha: Vishnu means Sarvavyapi. Upayathaha means “ came”. The Lord who is sarvavyapi need not arrive ( come to a place) like an ordinary man. He can appear even from a pillar like he did so in the Narasimhaavathar. If he does so then the Devas would not be able to enjoy the beauty of the Lord on garuda. He hence came so only because he wanted to give the bliss of His darshan on the Garuda. Pls can you also add the source of the slokha and a audio rendering to help us learn the slokha with the right pronunciation.